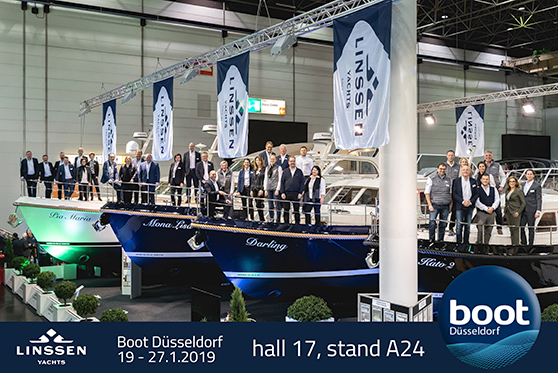 Many thanks for the opportunity to meet you at our stand at BOOT Düsseldorf 2019. We hope that you gained a satisfactory picture of our Grand Sturdy series of luxury steel motor yachts and that you obtained the information that you were looking for. We also hope that the world’s largest boat and watersport show was just as successful for you as it was for us. Our Grand Sturdy and Variotop® yachts attracted a great deal of interest throughout the entire show. One of the crowd-pleasers was our new world first, the Linssen Grand Sturdy 450 AC Variotop®. If you have specific questions or if you are already interested in a trial sailing in the near future, contact us or your local dealer. We look forward to welcoming you to Linssen Yachts in Maasbracht or at one of our dealers. The Linssen Collection Weekend: 23 to 25 February, inclusive. An exceptional show featuring a great many pre-owned Linssen yachts. The Linssen In-Water Boat Show: 5 to 8 April, inclusive. An excellent opportunity for a trial sailing on the latest Linssen Yachts models.